I'm trying to re size some of my pics so they will fit on the forum without running off the top and bottom of the page, idea being you don't need to scroll up and down to see the whole image. Ive tried re sizing in photobucket and p,shop elements to no avail. I'm very new to this computer malarkey so I'm sure its me doing it wrong. Can anyone explain what to do in easy terms? I'd be most grateful. In Photoshop Elements go to the Image menu and click on Resize... another menu will open and from this select Image Size. In the box that opens...in the Pixel Dimensions section, enter the number of pixels wide you want your image to be, 800 is a good size for the internet. Your height should auto-adjust to match, if it does not tick the Constrain Proportions checkbox near the bottom of the box. Don't worry about the Document Size section, it does not apply here. Now for the tricky bit... put a tick in the Resample Image checkbox and select a resample type from the drop down box under that. As a general rule of thumb, select the Bicubic Sharper (best for reduction) option... and then click OK. DONE! Your image will be resized. Save your image under a new name using the Save As... option. EDIT: I have just double checked. you cannot enter a pixel width until you check the Resample Image box... this will then make the Pixel Dimensions section active for editing. 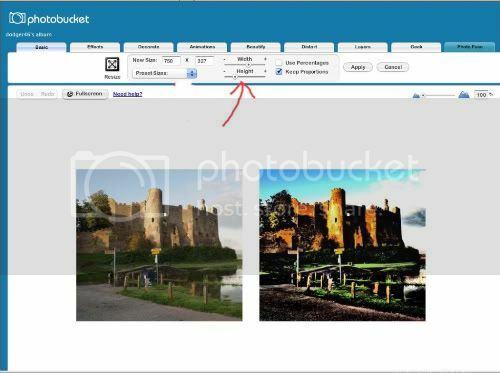 if you want to do it in photobucket, just hover your mouse over the photo you want to resize, then when the options box appears click edit. then click resize, and move one of the sliders shown below, you only need to move one and the other moves automatic. when you have the size you want click "replace original"
It is only this last few month or so I have really been into post processing photographic images. I have been watching tutorial videos from Lynda.com, Kelby Training etc. But I once ran a site for people to request forum graphics like Avatars and Signature banners, so I have some knowledge of graphic manipulation... but I am no expert. It was only ever a hobby.